Socket Bluetooth Cordless Ring Scanner (CRS) Series 9 is a wearable, hands-free, and lightweight barcode scanner that provides effortless and reliable data capture for the mobile workforce. The Bluetooth module pairs with any Bluetooth-enabled computer and reliably transmits critical barcode data from a distance of up to 300 feet (100 meters) providing unprecedented freedom of movement to mobile workers. Engineered with a unique Liquidmetal housing, its ergonomic design is rugged to endure even the harshest environments. 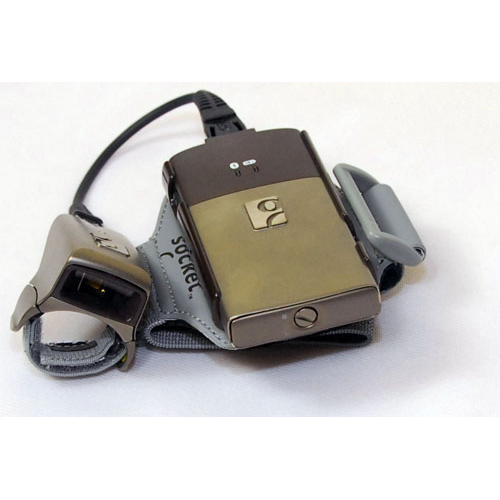 Wearable form factor enabling hands-free scanning or multi-task operations. Extremely durable with exclusive Liquidmetal housing. Up to 300 ft. Bluetooth connection range. Powerful SE955 Class 2 laser for maximum scanning performance through plastic, Mylar or thick glass, and at greater distances (45+ inches/1.1+ meters). Easy and quick deployment that works within an existing network infrastructure. Personal and washable wrist strap. Field replaceable coiled cable connection to optimize production up-time. Dual trigger for quick and easy scanning. High capacity rechargeable Lithium battery for long run times. Lightweight, ergonomically designed for easy handling. Designed with enhanced safety measures.